The EKG receiver detects the Heart Rate of a user from the Polar transmitter belt that the user wears around the chest. Polar transmitter belt is not provided by Thought Technology and must be purchased separately. The EKG Receiver detects the heart rate of a user from the Polar transmitter belt T31, T31c and WearLink®+ (not provided) that the user wears around the chest. The Wireless reception range of the EKG receiver is deliberately kept short, typically 80cm (2.5 feet) to prevent it from connecting with other belts in the neighborhood of the user. Wireless transmissions from the transmitter to the EKG receiver, thus no electrodes are needed. 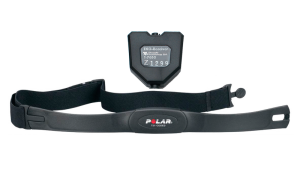 Polar™ transmitter belts are slim and light, easy to position on the chest, and fully water resistant and designed for all weather conditions. PolarTM transmitter belt T31, T31c or WearLink®+ is not provided by Thought Technology and must be purchased separately. It can be easily purchased at your local major department stores, sports specialty stores, or other stores. PolarTM has 2 variations of transmitter belts: coded and non-coded. PolarTM CODED Wireless Technology is to greatly reduce CROSSTALK issues when equipment is placed in close proximity to other equipment (typically in health clubs where equipment is placed < 1 ½ feet apart. ), so that one person’s PolarTM watch won’t pick up the heart rate from the person next to you. Our EKG Receiver can detect heart beats from both coded and non-coded PolarTM transmitter belts. However, EKG Receivers with serial numbers from E1024 to E1098 do not differentiate between them. These will still receive and process the signal, but will treat the coded belt as a NON-CODED one. Compatibility: fully compatible, except the EKG receivers with the serial numbers listed E1024 to E1098. Those receivers will treat T31c transmitter as a NON-CODED belt (like a T31 transmitter). 2. The output of the EKG sensor is AC (capacitive) coupled. Therefore, in order to set the DC level of the signal when connected to a DAQ system, it is usually necessary to connect a DC bias resistor between the signal (pin 3, green wire) and ground(pin 1, shield wire). A typical value for this resistor is 2.2 Megohms. If no resistor is connected, the DC signal level may be unstable, and may drift upward or downward and saturate the DAQ input. This condition will result in an unusable signal but will not typically cause any equipment damage.